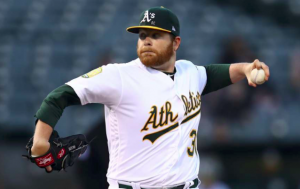 For the second time in less than a week, the Oakland Athletics have lost a key part of their starting rotation to injury. The club placed veteran lefty Brett Anderson on the DL Tuesday with a strained forearm. The move comes just a few days after fellow lefty Sean Manaea was sent to the DL with a shoulder problem. Manaea has since been shut down indefinitely with rotator cuff tendinitis. The injuries leave Oakland scrambling to fill out their starting rotation in the middle of a playoff fight. Anderson hits the DL one day after giving up five runs on seven hits over 2.2 innings against the Astros. The bad outing caused Anderson’s ERA to leap from 3.47 to 4.02. The lefty also missed a month of action earlier this year with a shoulder issue. However, when healthy, he’s been an invaluable part of Oakland’s rotation despite starting the season in the minors. Prior to Monday’s start, Anderson had allowed just two runs over 26.2 innings during the month of August. The A’s haven’t indicated how long they expect Anderson to be out. But he does have a rather extensive injury history. Anderson made just three starts with the Dodgers in 2016 while back problems limited him to 13 starts last year. Considering his injury history, the A’s may not want to rush him back, even in the midst of a pennant chase. Injuries are nothing new to the Oakland rotation this season. The A’s have already used 13 different starting pitchers amidst a myriad of injuries. But with Manaea and Anderson going down in the span of a few days, Oakland’s rotation has been trimmed to three reliable starters: Edwin Jackson, Trevor Cahill, and Mike Fiers. Frankie Montas is expected to take Manaea’s next scheduled start later this week. He’s been solid in 10 starts this year, posting a 3.75 ERA. Dave Mengden will start in Anderson’s spot next time around the rotation. He is 6-6 with a 4.28 ERA. Both should be capable fill-ins. However, it’s tough to deny that each would be a drop off from what Manaea and Anderson have done for the A’s this year. In short, the A’s can’t afford to be without Anderson for long, especially with Manaea’s season suddenly in doubt. With an ailing rotation, the A’s may be forced to rely on their bullpen for more innings. Oakland has added several notable relievers via trades over the past month, so they have good depth. However, they definitely don’t want to overburden their bullpen with too much extra work this late in the season. At this point, the A’s may be forced to explore a trade for a starter before the waiver deadline on Friday. They may not be able to find a deal worth making. However, the status of both Manaea and Anderson is up in the air right now. Even with a 4.5-game lead for the second wild-card spot, the A’s may need to bring in outside help to solidify a playoff spot. The loss of Manaea and Anderson in quick succession has dealt a huge blow to Oakland’s playoff chances.